We’ve been busy on the Encinitas City Council! Every week I’m struck by the importance of the decisions we make to improve our city. A recent choice about the placement of the Coastal Rail Trail could be the biggest decision I’ve made in my first six months on the City Council. It has received surprisingly little media coverage, and I’d like to share my thought process on making the choice. When a county-wide agency (SANDAG) offers to build a $5.1 million bike and pedestrian trail in the railroad corridor of your city, I think it’s an opportunity we should seize. The City Council has heard several presentations over many months that boiled down to us being offered three options: 1) build a trail in the dirt east of the railroad tracks, from Chesterfield to Santa Fe, where bikers and walkers will be safely separated from cars, 2) use that money to enhance the existing bike and pedestrian facilities along Highway 101, next to speeding cars, 3) reject the money entirely and do nothing. Councilmembers Tony Kranz, Lisa Shaffer and I chose the first option. For me, it’s important to focus on identifying the greater good, which is building the infrastructure that allows everyday people to go everyday places without having to get in their cars. We already have bike and pedestrian facilities along Highway 101. The beauty of the rail corridor option is that we’re not eliminating lanes or reducing options for drivers, we’re simply adding infrastructure for those with strollers, dogs, bikes and two feet. And we’re doing it on the side of the tracks where everyone lives. This will allow residents to walk or bike to Seaside Market, Cardiff School, the library, Wednesday Farmer’s Market, or into downtown for work or dinner. Right now, we drive to make these trips because we haven’t built the infrastructure to make walking or biking feel safe and pleasant. This trail will give us a new way to move around our city. More residents outside in the fresh air will also make the roadway less congested for those driving. The reality is that development, population increase, and the popularity of our city for tourists means that year after year our traffic increases, we spend more time idling in bumper-to-bumper traffic, and frustration builds. This trend will continue unless we invest in alternatives that will give us the opportunity to do it differently. 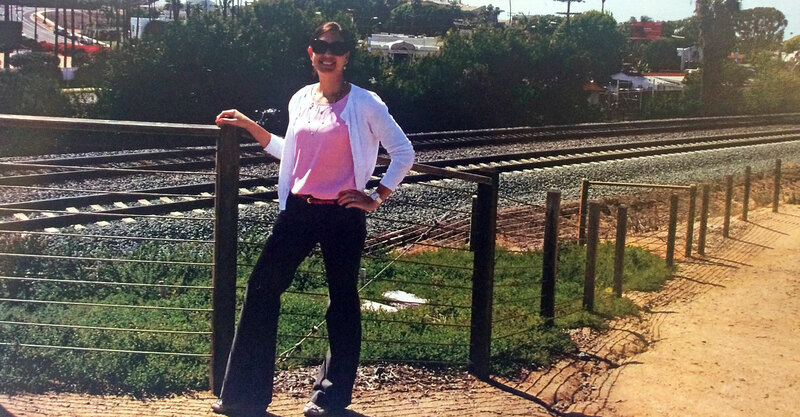 City Engineer Christy Villa stands by an example of fencing along the railroad tracks. Despite the relatively low risk of accidentally being hit by a train (eight fatalities in five years, according to NCTD) the railroad will require a four-foot, post-and-cable fence like this to be built when the rail trail is put in. Unfortunately there is simply no way around the fencing requirement. As a result, the city is actively pursuing authority for more legal crossings. The first crossing is likely to be at-grade at Montgomery Avenue (the photo below shows Montgomery as it looks today). An at-grade crossing means you can walk straight across the tracks. It’s not a tunnel or a bridge and is similar to what we already have in downtown Encinitas at the train station. It’s a far cheaper option but has regulatory hurdles that we are committed to tackling in partnership with NCTD and SANDAG. A Montgomery crossing is centrally located for the six surf spots in the 1.3 miles between Chesterfield and Santa Fe. It is a relatively flat area directly across from Cardiff School that had a car crossing in the 1960s. The other trade-offs relate to parking and train horns. Right now, cars park haphazardly all along the rail corridor and can face the ocean. With the new rail trail this won’t be possible in many places. The plan is for the parking to be standardized, with parallel parking on San Elijo Avenue. Displaced parking spots will be relocated as much as possible. Ideally the rail trail will include benches so those who park can get out and sit to look at the ocean. As for train horns, we will be pursuing a “quiet zone” to reduce the noise impact. These issues and many others will be fleshed out as part of a $175,000 Caltrans Sustainable Transportation Planning grant we’ve secured to come up with a comprehensive Rail Corridor Plan. With information presented comprehensively at community meetings, the Council and the public will be able to discuss the possibilities for long-term solutions such as trenching (as in Solana Beach), more under-crossings like the Swami’s pedestrian underpass at Santa Fe Drive, and all other options. Over the past 30 years, the city has seen multiple studies, and those results will be compiled and presented as part of the Rail Corridor Plan. In addition to the above, the city staff feels optimistic about our likelihood of receiving a grant for a grade-separated crossing at El Portal Street in Leucadia. And the Federal Railroad Administration recently awarded $2.2 million to improve the Chesterfield Drive railroad crossing. A sentimental part of me feels sadness when the natural environment is changed, even if it is for improvements. For three generations my family has walked, run, crossed the tracks and enjoyed the undeveloped rail corridor. But it’s already far from pristine, with periodic dumping of gravel and other materials near the tracks. There is a lovely section in Cardiff called Carpentier Parkway, boasting a variety of native and non-native plants along a winding dirt path. (Thank you to the local volunteers who maintain this.) But we can’t follow that path north all the way to Santa Fe without dodging onto the street and skirting around parked cars, which means the current path doesn’t effectively connect the two towns of Encinitas and Cardiff. To put it simply, I’ve wrestled with the trade-offs associated with building the rail trail in the railroad corridor for many months. My overriding feeling is that this is an opportunity to leverage outside funding to improve our community that won’t come around again any time soon. When I look at Solana Beach, I see visionary planning in their decision to leverage railroad money to create a beautiful rail trail and a trenched railroad track. Choosing the east-of-the-tracks option seems to be the best decision for our city, even given the trade-offs. I’m very grateful to my two colleagues, Councilmembers Lisa Shaffer and Tony Kranz, for their vision in supporting this option and for their work as the SANDAG and NCTD representatives to make the plan viable. A few days before the vote they said they walked the approximately 2.5 mile loop first along Highway 101 and then back in the rail corridor to make sure their choice was the right one. Out of respect for my four colleagues I try not to paraphrase their perspectives on the issues we decide but this Encinitas Advocate article lets them speak for themselves. And here’s an insightful op-ed on the topic from local resident Judy Berlfein. Previous Post5/18/15: Strong City FinancesNext Post6/14/15: More Law Enforcement?